My husband Joe and I have done a lot of hiking in our time and we really enjoy it. There is no better way to see an area , whether it be the Grand Canyon or the Cinque Terre in Italy. When hiking you feel as if you are part of the landscape and the nature around you. Hiking can give you an almost natural high, especially for those of us that work in office buildings most of the time. The senses are overwhelmed by the sites and smells. Hiking takes good planning. We always have our backpacks and we have learned many things over the years of what is needed in those packs for the particular hike we are on. We have watched enough survival shows to know that even when you think you may be on a simple day hike, you still should have the ability to make fire, a jacket, and food and water. If you have those things you can survive long enough to be rescued in most situations. I like to bring a light jacket no matter where I am. It can be used for the obvious changes in weather to cooler temps and can be used as a bug jacket. I also like to have my rain jacket, which works for rain or additional warmth to layer over the light jacket, or as a windbreaker. I always have a Swiss army type knife along. It has never been used for anything except slicing cheese, but of course, if we ever did run into trouble it could come in handy. I bring water and usually have at least one water bottle that is frozen. It can keep your sandwiches cool all day and as it melts it provides cold water later in the afternoon, especially on those hikes in places like the Grand Canyon and Utah where it can get very hot later in the day. It also doubles as ice for injuries. Then we have our Gatorade and snacks, like nuts and dried fruits, and I like my vacation candy—Hot Tamales. Now normally I make the sandwiches for our hikes and we pack the backpacks together in the morning. Most often I choose ham or bologna as the meat for the sandwiches because, while they are not the best for you, they do not spoil easily. I will admit it, I am paranoid about such things, probably because of taking microbiology as a nursing student. 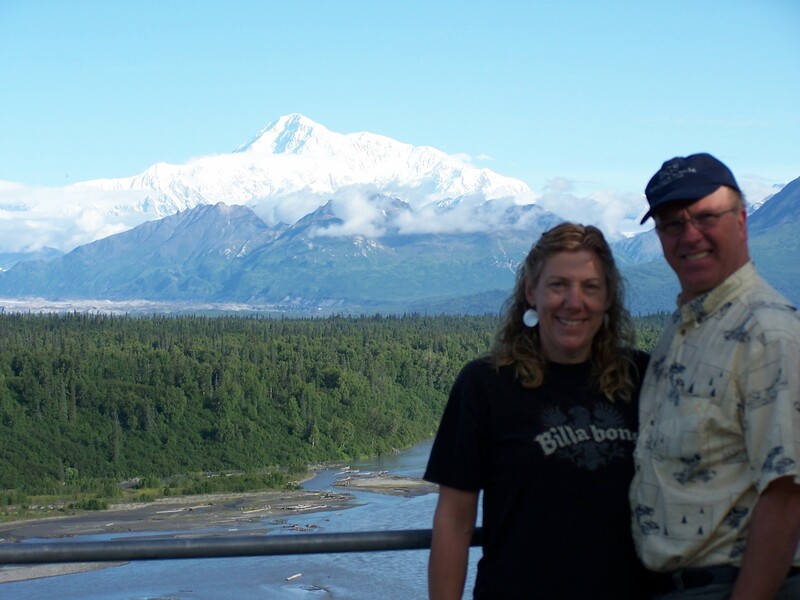 My adventure buddy, Joe, and I were vacationing in Alaska and seeing the sites for our 25th anniversary a few years back. We were there for two weeks and did a lot of fun things. 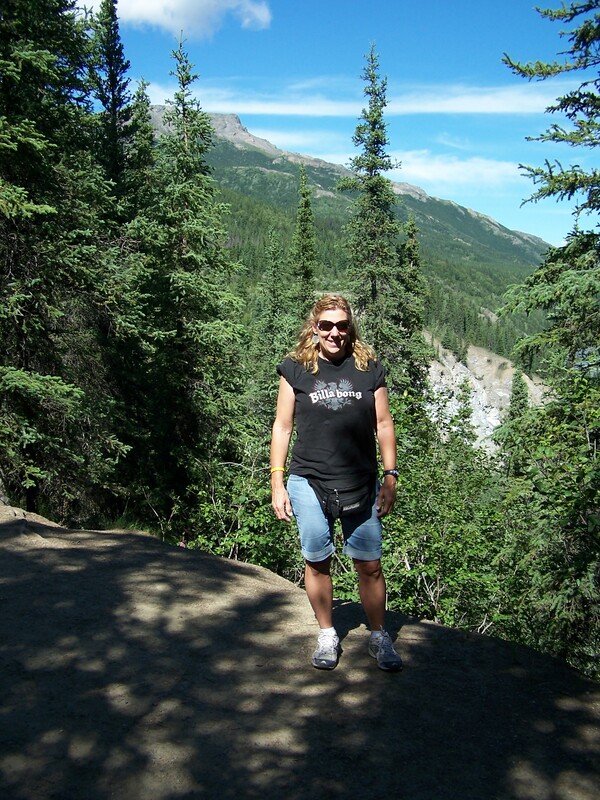 On our first day at Denali National Park, we decided on a day long adventure and hike. In Denali no vehicles are allowed. They have buses traveling the Park roads on a regular schedule and you can get on and off as you like to hike or explore, and when ready, hop back on a bus as it comes along the dirt roads. Despite the buses, this is a very wild and remote area. When we arrived in Alaska we had rented a car and were taking a driving vacation on a pre-planned route. Our first stop had been a Wal-Mart to get a cooler, some ice, bread, meat and groceries, chips, water, Gatorade and beer. We had picked up a few extra things including a can of tuna. On the morning we decide to have our adventure in Denali, I saw the can of tuna and decided to make the tuna sandwiches for something different. I had my frozen water bottles to keep them cold and it was not so hot that we had to worry about the sandwiches spoiling. In my defense it was before 7 a.m. in the morning when I was packing the backpacks for the day’s adventure, and maybe was not fully awake yet. I packed the sandwiches and our usual other snacks and stuff to sustain us for a full day of fun in the wilderness. After all, we were not going to be anywhere near any restaurants or stores, we had to sustain ourselves. After we had everything packed, we were off with our maps of Denali, our GPS and a load of excitement and anticipation. We boarded the bus at the Main Entrance with our adventure pants on and our cameras ready. Our excitement and anticipation was soon fulfilled. The bus rolled along the gravel roads, about half full of all types of visitors. The grandmas and grandpas who only rode the bus and never got off, the families on adventures together and the traveler who you would choose to have with you if you got lost or in trouble out there. You know the kind that look like they live off of cliff bars, have a bandana over unwashed hair, and look jacked like they could free climb a glacier with those muscles while helping drag you along. They were all there on their various adventures. Everyone filled with excitement. The bus would stop every once in a while along the bumpy road to point out animals and give people a chance to take pictures. 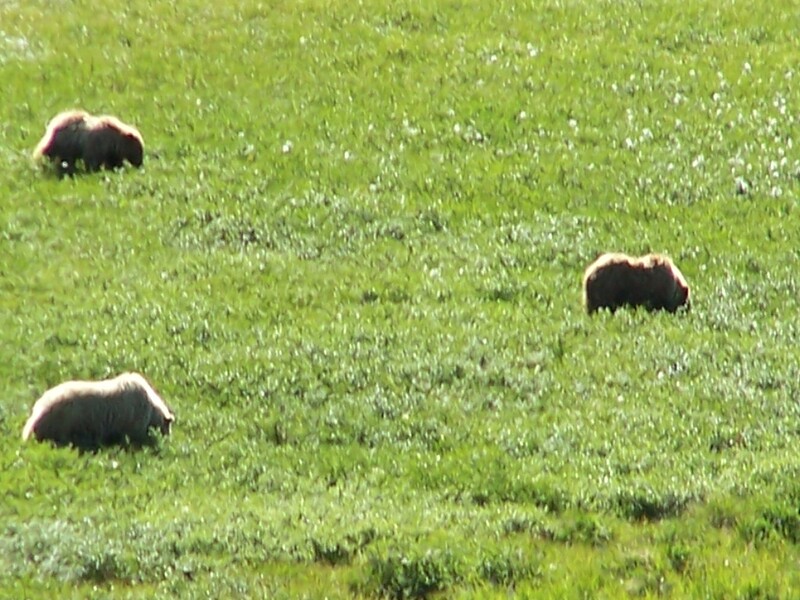 Most of the animals were a good distance from the bus, out in the meadows or on the mountainsides. Occasionally hikers got off the bus and others were picked up. There were no formal stops just people along the gravel road waiting for a ride. 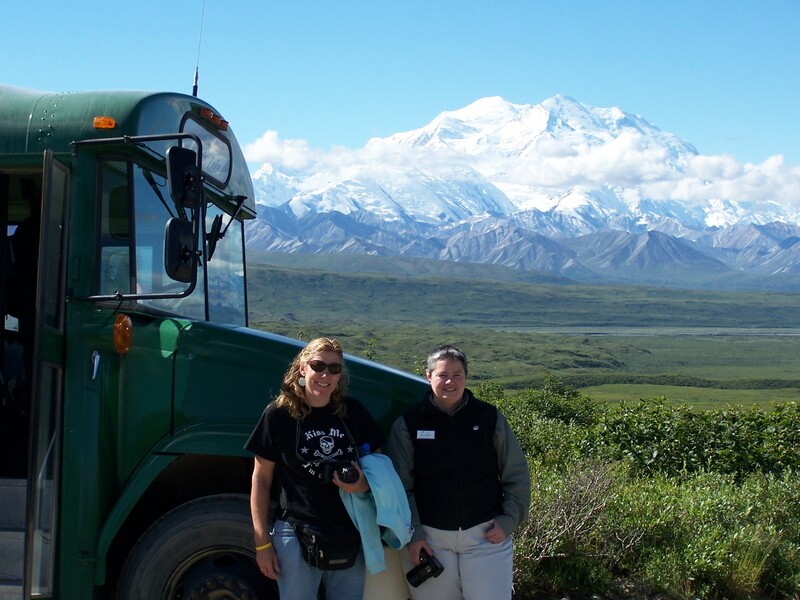 Our plan was to take the bus to the end of the road and hike the very back country of Denali. The bus ride with stops took about two hours. After about an hour of looking and photographing wildlife from the bus, including a wolf pack with pups, and multiple stops to see the grizzlies down in the valley, eating the blueberries, which were ripe during our July visit, and their cubs, looking so natural and cute from the bus windows. A horrible thought came to me as the bus driver told us about salmon being the grizzlies favorite meal. Joe was startled as I grabbed his arm so hard I think I left a mark. I said, “I have tuna sandwiches in our backpacks. We will smell like tuna when we get out and hike.” I wanted to fling them out the window, but that would result in a huge littering fine. I was perfectly fine with going hungry, but the thought of having tuna on our backs was like ringing a dinner bell for the bears. It was like baiting the bears to come eat us. Joe always the calm one, just laughed and came up with a solution. Let’s just eat them now. Good idea I thought, until we were finished and I said, “Now we really smell like tuna.” Our breath, hands and everything at this point reeks of Tuna. This is such a bad idea. I was really concerned about whether we could go hiking safely in Grizzly country. This is why I love traveling with Joe – nothing gets him worried. He reassured me that the hand sanitizer would take away the smell and that the grizzlies were more interested in the blueberries at this time of year and none of this is probably true, but he convinced me that Grizzlies in the wild don’t know the smell of tuna, and so they would not be that attracted to us. It was convincing enough, even though at the time I knew he was probably making it all up, to put my mind at ease so that we could enjoy our hike. We got off the bus at the end of the Denali road at Wonder Lake as planned. It was the most remote area we have ever hiked, and as that bus pulled away and we stood there, just us, with our backpacks and adventure pants on, I have to admit that it was a little scary at first. But the awe inspiring beauty was breathtaking and worth the bravery it took to be there. Just standing and looking around at the lush green forests and the deep blue waters of Wonder Lake, in the shadow of Mt. McKinley rising above the valley, all of our worldly worries washed away with the sunlight. There is no better way to reconnect with our purpose on this earth, than to enjoy its natural beauty and the mysteries around us. We often get caught up in our little work a day issues and forget our place in the universe and how short our time on this earth could be and is. We need to explore and reconnect with our natural places, to ground ourselves and re-connect and refresh our inner spirit. Be brave. Travel and experience new things and bring your adventure buddy—that person who reassures you that all will be fine and leads you to new adventures.